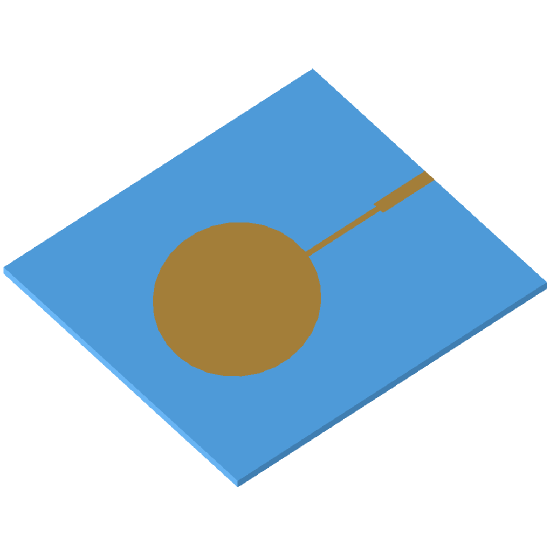 Image of the Elliptical Edge-fed Circularly Polarised Patch. Microstrip or patch antennas are popular in the microwave frequency range because of their simplicity and compatibility with circuit board technology. Dual-fed patches may be used to produce circularly polarised radiation but this requires the use of a feed network to provide equal excitations and a 90° phase shift between the ports. The elliptical patch described here has the advantage of using a single microstrip feed connected to the edge of the patch, at 45° to the axes of the ellipse. A disadvantage of this type of feed is that a quarter-wave transformer typically needs to be used to match the high impedance at the edge of the patch.